Component Description – The mainline is the pipe from the backflow preventer to the valves. Always under pressure, it is typically the largest diameter and thickest walled pipe. The lateral line is the piping after the valve, only under pressure when the valve is turned on. Causes of leaks: Some pipe and fittings can be affected by a quick water surge due to high pressure from the city mainline. This is called water hammer and it can significantly fatigue thin walled pipe and fittings. Mowers shearing off sprinkler heads, or broken risers. Raking off of drip emitters. Bubblers breaking off due to foot traffic. Digging with hand tools or trenchers in piping areas. In some areas gophers may pose problems. Problem – Standing water or ground saturation along piping runs, valve boxes or around sprinkler heads. Fine soil being brought to the surface through a small hole. (Mainline breaks are very noticeable and immediately identified as such. Small cracks in the mainline may take more time to notice. There will be lots of water that eventually gets to the surface. A ruptured mainline is usually the result of a sharp blow from shovels or picks when digging. For example: a hole for a new plant. 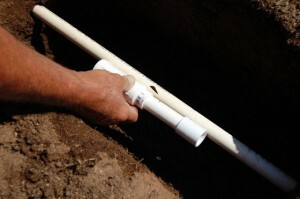 Knowing the location of the mainline can prevent it from being damaged). Diagnosis – Piping is cracked. Loose or broken fittings at valve. Missing sprinkler head or misshaped or reduced spray pattern. Cracked fittings at sprinkler head or bubblers. Drip emitter fittings have come loose or are missing. Repair Remedy – Piping- Shut off irrigation at backflow preventer or water shut-off valve. Isolate the exact location of the break in the piping by digging down through the wettest area. Excavate the area around the damaged pipe to have plenty of room to work. Determine the size of the cracked pipe and the extent of the break. Using a PVC pipe cutter or wire saw, remove the broken pipe. Acquire the replacement fitting.”Slip-Fix’ fittings are preferred due to their ability to telescope out to bridge the gap left by the removed pipe. Add coupler fittings as needed and use a good wet dry glue. For soft poly pipe – isolate leak. Cut out damaged area and replace with a new compression fitting. Small holes can be sealed with a ‘goof plug’. Tighten all end cap fittings and replace lost drip emitters. Water hammer prevention: Use a thicker class pipe. Support any mainline fittings with concrete thrust blocks. After the repair is complete and you think some dirt may have entered the mainline; remove the top of the last valve and flush the lines by opening the backflow preventer. Replace valve top and activate the valves to test the new repair before backfilling over the pipe.